Coming 2019!! We're Building a 2 New Pools with Splash Water Park and Family Event Pavilion!! 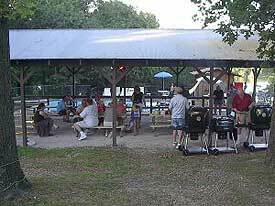 Lakeside Resort offers a large, open, covered pavilion houses 6+ picnic tables, grills, and sits right beside the pool, and playground. This atmosphere is just right for family, children and friends of all ages. How about a pizza or two for your event? With the new Lakeside Restaurant, we'd be happy to deliver it to the pavilion for you. Look over our MENU. (Remember we offer gluten free selections.) Our swimming pool is also available. We also have Lodges, Villas, Log Homes, Lake Homes and Cabins each fully furnished with complete kitchens and covered porches. These units provide an excellent variety of accommodations to meet your family reunion and multi-family needs.